Seventy percent concrete-matured Grenache and 30 percent wood-matured Syrah make up this less-than entirely felicitously named wine. The quality of the liquid is hard to resist however, with purity born of altitude and exceptional length. The Rasteau microclimate lends warmth and power. Escaravailles is located high in the hills behind the villages of Roaix and Rasteau, where the vines enjoy a special microclimate: relatively warm despite the altitude, with exceptional expositions and soils which are dominated by red and blue clay. Gilles Ferran describes his 2013 as ‘aromatic and fresh’, to which I would add the wines’ generous and very attractive texture, which stands out immediately. 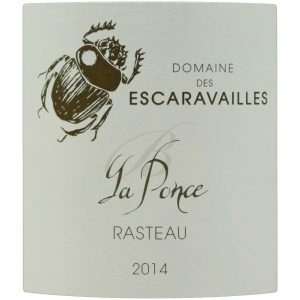 The 2013 Rasteau La Ponce offers a forward, delicious style to go with notions of juicy berry and strawberry fruits, underbrush and flowers. Elegant, lively and with fine tannin, it’s a pretty wine that makes the most of this lighter weight vintage. It should shine on release and deliver plenty of enjoyment for 3-4 years.